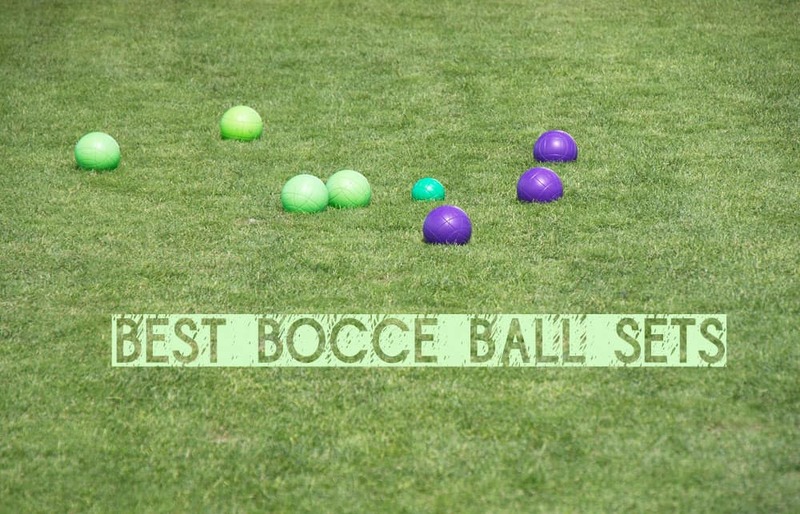 Bocce ball is a great game to play with friends and family in a variety of different settings. It can be played with all ages and allows for hours of entertainment, but before any of that fun can begin it is important to have a good, solid bocce ball set, one that will allow you the ability to play and stand the test of time. If you want to know what sets the standard of a good set, read on to discover what to look for when making your next purchase in the world of Bocce Ball. If you are in a rush and don’t want to read the reviews then we have picked out our choice below. A well weighted, well made set that comes in a well built wooden multipurpose carry case. What more will you need? Has amazing reviews and is easy to carry around and for the right price. There are a few things to consider when buying a set; who is playing? What is the level of play? What is the amount you are wanting to spend in relation to the quality you desire? How do you decide between the cheaper set versus the more expensive one? Let us examine each of these questions in full before we look at some possible sets that will fit your need. Who will be playing the game? In this situation, the size of the balls needs to be considered. A smaller size set, with balls of 74 mm to 100 mm are good for kids and older hands. For children, it will mean that the balls can fit in their small hands and for the elderly the lighter weight will be ideal for them when making their throws. For regular adults, the typical size of a ball is to be 107 mm in dimension. Now that we have considered who is playing we need to recognize the level of play. Is the game being played for leisure, something that involves the children on the beach or backyard, or are you taking this to a more professional, competitive level? When looking for your perfect set you want to be aware of a few things; according to the International Federation for Bocce Ball rules, the balls need to be 107 mm for all adults, but for women they can choose a smaller ball of 106 mm. Many of the less expensive sets often allow for the smaller balls outside of regulation, and they don’t consider the weight that is required, that of 920 g per 107 mm ball. Therefore, if your plan is to play the game at a higher competitive level then you will be required to buy the right size and weighted balls. It is equally important to consider the material with which the bocce ball is constructed. The best material comes from resin, but many are made from plastic or a combination of recycled material. When this is the case, often the coating will be worn off or even chipped, and as a result the ball can become smaller and will not roll accurately when thrown. Also, consider the frequency the balls will be used as the material you chose should reflect that. Now let’s examine what will likely make your decision the hardest; the different costs of sets and what you may find as a result. The cheaper collections go for around $35 for a set, but keep in mind you get what you pay for and are likely buying a product that has been made with lesser quality materials, something completely reasonable for an amateur player. Higher quality balls are made using resin and some include quality stitching, as well as provide a carrier for the balls that relates to the quality of the balls itself. This is not to say avoid the cheaper sets, they do have their purpose; this is the type of set you would want to consider if your intent to play the game is meant for the occasional family or friend outing. This is not the type of set you would want if you desire to enter a competitive bocce ball tournament. Consider the surface you are playing on, will it be grass or a bumpy, sandy beach; then a more expensive set here wouldn’t make much of difference since the ground the balls hit is uneven and inconsistent anyways. The next price range would be between $40 – $100. Sets like these might have an outer resin shell, but the inside might be a mix of plastic or other lower quality products. Because the inside is made from recycled materials the weight will be different and the value of the throw during the game, plus the roll afterwards, will be affected. The highest price point, above $100 should be made from a high-quality resin (you might see the names phenolic or thermoset accompanied along with the word resin) and therefore give you the correct weight that is required when playing the game at a higher level. But don’t expect your bocce balls not to scuff, it is part of the game, some might even consider it battle scars to be proud of, but keep in mind that chipping of the balls finish is not. Anything that is higher in cost, $150 plus, is more about the appearance or brand of the balls; perhaps the color, pattern, or a marbling technique, or maybe the packaging of the set itself. Finally, you want to consider the carrying case in which the balls come. This might seem like an inconsequential matter, but it can make a difference when lugging around your set. Would you prefer a stylish box or perhaps a durable weather-proof bag with a strap? It might be these small details that make the difference for you. If you find a set with larger balls, over 107 mm, these are not legal and the company who has chosen to create these ball sizes has likely not done the proper research. If you are looking to play the Italian version of the game watch out for those that are sold as Petanque, the French version of the game. It is not to say that you should avoid this style of the game, but just be aware that the same size of balls is not used in the original Italian game, and if your desire is to stay true to the classic game, these balls would be considered against the rules. Also, consider that in Petanque, the balls are made of steel or an alloy material, therefore should not be used in the Italian version of bocce ball. Watch out for fancy names that are given to the sets, such as “competition”, “tournament”, “expert”, and “professional”, especially if they are given to a cheaper set. These words should realistically only be applied to balls that fit the resin quality, and the approved specifications of size and weight. Now that you know what you should consider when looking for your perfect set, let us look at some different ones out there that you might want to consider for your bocce ball needs. This is the lowest priced set and includes 8 bocce balls, in classic Italian colors, green and red, with two different scoring patterns to increase player participants from two to four people. Their size is 88.9 mm (more for children or adults with older joints) and is made up of a poly-resin, which will result in a lighter weight and an inconsistent roll, therefore better for uneven ground play. It provides a sturdy carrying case with dual straps. With its smaller balls and lower price, this set is best suited for casual play. Once again these are smaller balls, but provides the buyer with four colors for a less confusing way to play with four players. Material is a poly-resin and each ball weighs in at 1.6 pounds, less than the 2 pounds’ standard by the Bocce Standards Association. 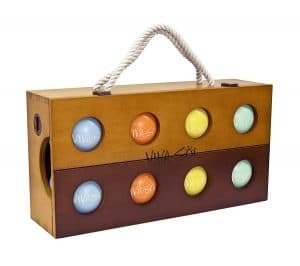 The four sets of colored balls are more attractive to family play; the young children will be delighted to have their own color, and the weight and size are more suited to small hands. The price, in medium range, makes it ideal for casual, family fun. These too, are on the smaller size, measuring in at 100 mm, provide classic bocce colors, red and green with circle and square markings. The included case provides ball dividers and a shoulder strap to help carry it with ease. It also includes a measuring rope which might help with those tough decisions on the court when fighting over whose ball is closer to the pallino. Price is in medium range but still reasonable for a more informally competitive way to play the game. This set provides balls of two classic colors, red and green, with square and circle markings, from poly-resin material. The regulation size of 107 mm is approximately $10 less than the smaller size of 90 mm. The set includes a black, weather-resistant bag, with a strap for easy carrying. It also includes a measuring tape for deciding the closeness of the player’s balls to the pallino. Detailed rules of the Bocce game are included, both courted and free-form. The smaller ball set would be more ideal for children while the larger ball set provides regulation size for the adults to play. This set includes non-traditional pastel-colored balls with Viva Sol logo engraved on each. They are 107 mm and made from phenolic resin for 2-8 players. The case is all wood, with dual hemp ropes to carry around and is lined with foam to help protect the balls. As an added bonus, it has a bottle opener on the side of the case. These ones are quality-sized balls of resin for the traditional game, but with a light-hearted approach where the bottle opener is helpful to open all your bottle cap beverages. If you are looking for a more unique style to the classic Italian game, the beachy feel that this set provides is right for you. This set is featured on Caribbean Life for HGTV and is identical to the co-branded bocce set of Tommy Bahama. The balls are a smaller size, as they are meant for Petanque (French version of Bocce) with a diameter of 74 mm. It includes four non-traditional beach colors, made from synthetic polymers. This too comes with a measuring tape for any ball disputes and a set of instructions. Despite the higher price on this, the size and material of the balls would be more suitable for a casual play, as the name suggests, a day at the beach. The canvas case, with a handle is more casual in style and the higher price tag is likely due to the brand name of the set. This includes 4 sets of non-classic, brightly colored balls, 107 mm in dimension and made of solid resin. The storage box is made of wood and has a rope handle to help carry it around. At a higher price point, this set provides you with the quality and size that is required to play the game on a more competitive level. This set provides balls in two traditional colors, red and green, with different etching on each of the four sets; they are 107 mm and made from thermoset composite resin. Instructions for the game are included with the set and the pallino is yellow in color, unlike many others which are white. The case is made from mahogany-stained pine and has a single handle. This particular set is the official set for the U.S. Bocce Federation and meets all the requirements therein. At a higher price point this is a quality-made set to last a lifetime and can be passed on to future generations.